Billy Wallace decided to partner with Foothills in 2011 in order to place his 15 acre tract in Halls under conservation easement. This is truly a unique piece of land that includes a blue hole (or underwater sinkhole) that is part cave and part spring. 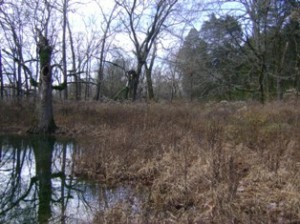 The property’s spring feeds into Beaver Creek that cuts through the Halls community. Adjacent to the blue hole is a bird habitat. Sparrows love the mix of grasses and nearby water source – allowing them a place for nesting and protection. The tree trunk (pictured) is the remanent of an ash tree that likely provides for bird, owl and even raccoon habitat.